Flotron’s 1200 series holding fixtures are large, high load capacity standard predesigned units. 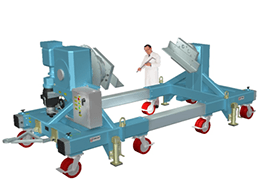 They have roughly 1.5 times the load and torque capacity of the 1100 series and are offered in two standard double beam configurations with fixed riser heights. They are supplied with heavy-duty stairstep resistant gearboxes to handle large, off-center loads which may occur during assembly of the mounted payload. 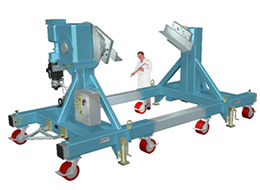 These models are especially suited for the largest, heaviest assemblies. See below for comparative data on both 1200 series models and click on either image for additional information about a particular fixture.